Michael Kusugak was born on the west coast of Hudson’s Bay in 1948. His early years were spent living a traditional nomadic life with his family. Home, in the winter months, was an igloo. The summer months were spent in sod huts and tents. In 1954, at the age of six, he was sent to Chesterfield Inlet to attend residential school. Arctic Stories is a collection of three short stories written from Michael’s early life experiences and told through the eyes of a fictional girl named Agatha. From witnessing the flight of a giant black airship over Repulse Bay, to rescuing Father Fafard from a fall through thin ice on the lake, the stories are vivid and engaging. Classroom Connections: Michael was raised listening to family stories passed from generation to generation in the traditional oral form. 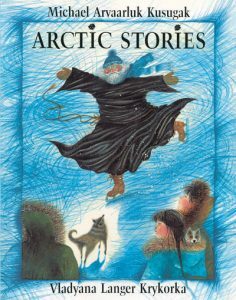 This collection of stories captures a feeling for a transitional time in the Inuit culture and history and resonates with the storyteller’s art.